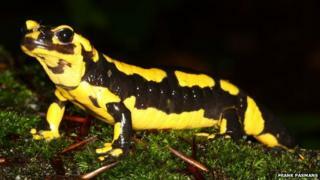 A deadly skin-eating fungus is threatening the fire salamander population in the Netherlands. It has driven the creature to the brink of extinction in the region though it's still unknown whether other countries have seen similar declines. Recognisable by its vibrant yellow and black skin, fire salamanders dropped to a population low of 10 animals before a treatment programme began. The findings, in PNAS journal, explain what caused their decline. Once researchers observed the near catastrophic decline, the animals were taken into captivity. A treatment programme was developed and youngsters have now been born. The team plans to reintroduce them into the wild once numbers are back to a sufficient level. A team of international scientists was able to isolate the fungus after analysing dead salamanders. Its Latin name, Batrachochytrium salamandrivorans, means "salamander-eating". A related fungus, Batrachochytrium dendrobatidis (Bd) has already threatened over 200 species of amphibians. "In several regions, including northern Europe, amphibians appeared to be able to co-exist with Bd. "It is therefore extremely worrying that a new fungus has emerged that causes mass mortalities in regions where amphibian populations were previously healthy," said lead author An Martel from the University of Ghent. She added that other countries did not have similar salamander monitoring programmes, so it was unclear whether populations have declined outside the Netherlands. "This is not the only species that would be susceptible. The problem is you cannot detect it if you don't have a good monitoring programme. "If the fungus is introduced into other populations, a lot of animals will die. We are encouraging others dealing with amphibian health monitoring programmes to test for the fungus," Prof Martel told BBC News. It is believed the fungus is spread by direct contact or from living in a contaminated environment, as the pathogen is able to survive in water for only a short time. Once a salamander has been infected with the fungus, it completely destroys the animal's skin. Co-author Matthew Fisher, from Imperial College London, said it was unclear why this outbreak was occurring now, though it was possible the fungus had spread to the Netherlands from elsewhere in the world. "We need to know if this is the case, why it is so virulent, and what its impact on amphibian communities will be on a local and global scale. "Our experience with Bd has shown that fungal diseases can spread between amphibian populations across the world very quickly. We need to act urgently to determine what populations are in danger and how best to protect them," Prof Fisher added. The team has now developed a diagnostic tool which can quickly discover if a salamander is at risk.